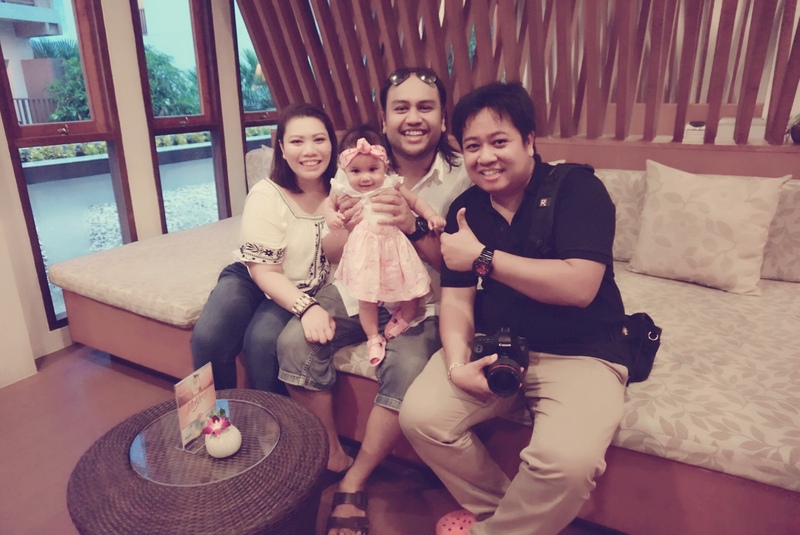 We just came back from our family trip to Krabi! Rusly took leave so we can go slightly earlier and hopefully avoid the crowd cos it’s the long holiday. Turns out, the plane was so full. With PRCs. We checked in early so we can have lunch and i was craving for CBTL Carbonara. Like craving gila. Then have to entertain this budak kecik cos dia boring kita makan sedap2 then dia kena tengok. Too bad, baby! U makan biskut je ok? Flight was delayed for half an hour. Not a big deal actually cos there were so many things to window-shop at the airport! Flight was terrible though. Not the plane. The journey! It was quite bumpy and quite frightening! Nadya was a gem though. She drank her milk and slept throughout the 1hr 45mins flight. We arrived to a rainy Krabi. Our airport transfer was still waiting, despite the long queue at the immigration. We finally checked in to our hotel around 5.30 pm. We stayed at the same hotel we stayed in previously cos we love the place. Very modern and not too busy with traffic. The breakfast was a bummer though. The chicken meat is halal but they serve bacon at the counter if you ask. So i don’t bother eating any meat. We just ate the toasted bread and cereal. With my little girl, checking the bathroom. Love the subway tiles! 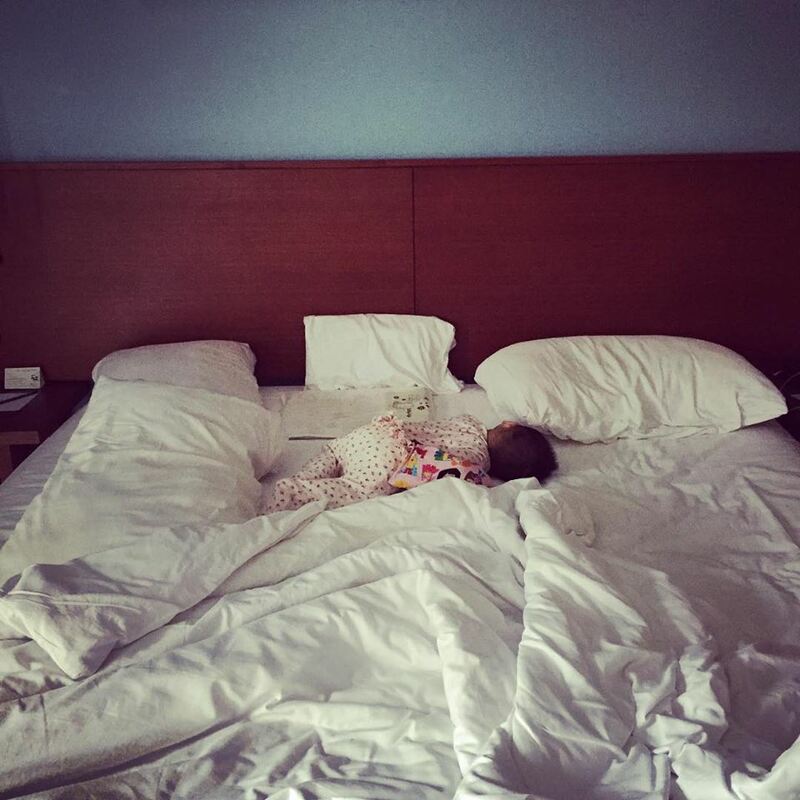 We initially booked a Deluxe Room & requested for a baby cot. But got upgraded to a Family Room instead. Which is huge, came with a baby cot, and a separate room for kids with a double decker bed. Well, it proved to be useful, for Rusly. Nadya totally conquered the King Bed. I was pushed to the edge of the bed and Rusly? Oh he had to move to the Double decker bed. Halal food was abundance on the streets! One of the reason why i love Krabi! Authentic Thai food. cheap cheap good good lah. We didn’t do any island hopping this time round cos we did it already when we went to Phuket & Krabi previously and Rusly didn’t wanna bring Nadya to a secluded island, since she’s still a baby after all. Which makes sense ah. I honestly never thought of that seh. I only thought of how leceh it would be to hop on & off the long-tail boat while babywearing. Hahahaha. #priorities. Lucky for us cos the weather was really bad! I knew it would be rainy season but i didn’t expect it to be that bad. We just came at the wrong week honestly cos it was ok the week before. Torrential rain all day long. It was a bummer cos bringing Nadya out in the rain is not ideal especially in a foreign country. I did standby thermometer and her fever medicine, just in case though but Alhamdulillah she didn’t fall sick. Didn’t bring the pram along this trip and babywear her throughout the trip. In the plane, while doing my foot reflexology, while eating and everywhere else.Babywearing saved my life. The pram would have been redundant cos it was raining each time we go out and also the walkways at Ao Nang aren’t that spacious and full of potholes. I used my new Lenny Lamb SSC this time round. So much love! I tend to reach out for my Lenny Lambs when we go travelling cos it’s so soft and floppy. Because it’s a wrap conversion, it’s more cooling than Tula Canvas so it’s good for warm places where we might or might not have aircon. We didn’t have to go very far cos they opened up a whole stretch of street stalls just outside the hotel. It wasn’t there when we 1st came to Krabi! Apart from eating, we also did a Family Photoshoot. Since we’re in Krabi kan and there’s nothing much to do and we’ve been wanting to do one with Nadya. One with Nut, our photographer for the day! Will update on the photoshoot in another entry. Next trip is in September, with my family and we’ll be heading to Jogja. Still not sure if we’ll be going KL again in October for my birthday. Hopefully yes because i wanna try out new cafes! hey alermak cik adek cute tu! semakin cute! masyaallah she’s too adorable la dyan! Aiyaaaaaahhhh u too nice lah! !